Day 1: Start using the Diet One Day Swiss Chocolate and French Vanilla wafers Eat fruit on your diet days. Consider berries and non-starchy fruit for best results. Day 2: Eat normal and don't worry too much about the diet but there is no need to binge. Be reasonable and lose even faster. Day 4: Repeat Day 2... 1 day on, 1 day off; Watch the pounds disappear. Questions? 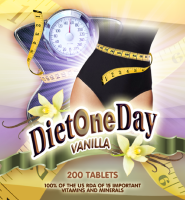 Visit Diet One Day wafers for more information. Here is the Diet One Day plan. One Day Diet -Day 1: - Use Diet One Day wafers and eat fruit (or you can add our negative calorie soup to any diet or non diet day to help as well.). Some people break them up over so many hours; such as 2 each hours for 10 hours. Remember to eat fruit as well. Don't forget to drink lots of water whether it be the One Day Diet or any diet you choose. Diet One Day - Day 2: Eat what you want. Either way you "could" eat healthier on these days but don't have to. Choose a diet of healthy foods is possible but really you can pretty much eat what you want within reason. Do your best on the non-diet days. Let's just say that with any diet you go on you will do better the sooner you begin to change your lifestyle. Is it necessary? No. But will it help in the long run? Yes. Always do your best. You continue this pattern until you fit the clothes you want and like what you see in the mirror. Don't you love a little something that will speed up your weight loss without stimulants or caffeine? Diet One Day Tablets both make great snacks for your off days. Some people use them for meal replacements when you are no longer needing to lose weight but would like to maintain more easily. The only reason you would gain weight back is if you learn nothing from this dieting time. If you overeat as a lifestyle you will always gain weight. If you learn to trust your body and eat only when you are hungry and give your body great food then, you will be Living Well instead of "DIEting" all your life. Eat to live. Also, you can add Lose While You Snooze in liquid or gel caps or Sleep Weight Loss, just before bed on an empty stomach and double your efforts. You can actually lose weight overnight and gain lean muscle while also building collagen which is essential in the repair of body tissue and restores elasticity. The lovely thing about the one day diet if that if it is there for you one day and still there the next day, even if you decide not to do it for that time. For instance, if you were to binge on a weekend getaway for 1 or 2 days and you didn't really need to lose a lot of weight but just a little.